Ornamental wall decor picturee featuring one of the most iconic French lighthouses off the coast of Brittany, AR-MEN. Made of wood, finished in a vintage rustic style in blues, off white and dark cream. Supplied with two wall hooks at the back. 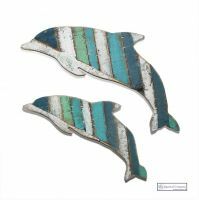 Approximate length: 29cm (11.4 inch) x width: 21cm (8.27 inch) x thickness:1.00cm (0.4 inch), about 2cm (0.78 inch) off the wall. 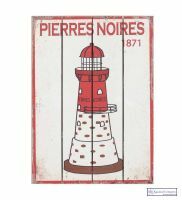 Pictured here with its sister lighthouse plaque "PIERRES NOIRES" but sold as individual items.